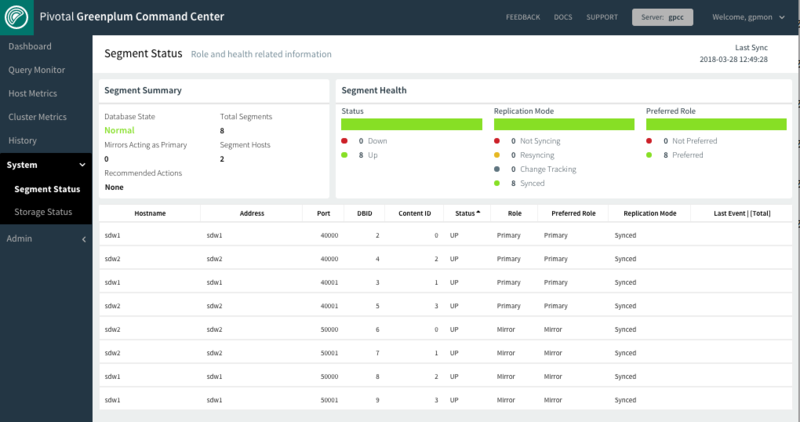 The Segment Status page provides a health overview for the Greenplum Database segments and details for each primary and mirror segment. Greenplum Database is most efficient when all segments are operating in their preferred roles. The Segment Summary panel tells you the overall segment status and if any mirrors are acting as primaries. The number of mirror segments acting as primary segments. These actions are executed from the command line using the gprecoverseg Greenplum management utility. See gprecoverseg in the Pivotal Greenplum Database Utility Reference for more information. The total number of primary and mirror segments in the Greenplum cluster. The total number of segment hosts in the Greenplum cluster. The Segment Health panel contains charts for Greenplum Database segments’ status, replication mode, and preferred roles. Numbers of segments that are down and up. A chart that shows the number of segments in each of the possible replication modes. Not Syncing: The primary segment and mirror segment are active and all changes to the primary segment have been copied to the mirror using a file block replication process. Change Tracking: If a primary segment is unable to copy changes to its mirror segment using the file replication process, it logs the unsent changes locally so they can be replicated when the mirror again becomes available. This can happen if a mirror segment goes down or if a primary segment goes down and its mirror segment automatically assumes the primary role. Resyncing: When a down segment is brought back up, administrators initiate a recovery process to return it to operation. The recovery process synchronizes the segment with the active primary and copies the changes missed while the segment was down. Synced: Once all mirrors and their primaries are synchronized, the system state becomes synchronized. The red portion of the Preferred Role chart shows the numbers of segments that not operating in their preferred primary or mirror roles. If the chart is not solid green, the performance of the Greenplum cluster is not optimal. Primary and mirror segments are distributed evenly among the segment hosts to ensure that each host performs an equivalent share of the work and primary segments and their mirror segments reside on different segment hosts. When a primary segment goes down, its mirror on another host in the cluster automatically assumes the primary role, increasing the number of primary segments running on that host. This uneven distribution of the workload will affect query performance until the down segment is restored and the segments are returned to their original, preferred, roles. The name of the segment host where the segment is running. The network interface on the segment host for the segment. The port number assigned to the segment. The unique identifier for the segment instance. The content identifier for the segment, from 0 to the number of segments minus 1. A primary segment and its mirror have the same ContentID. The master and standby master, which have ContentID −1, are excluded from the table. “UP” if the segment is running, “DOWN” if the segment has failed or is unreachable. The segment’s current role, either “primary” or “mirror”. The segment’s intended role, either “primary” or “mirror”. The replication status for the segment. See Segment Health for possible values. The date and time of last segment health-related activity. Click to display a list of recent events.